the circumstances in which this indication was given. Nothing in this guideline affects the duty of the parties to progress cases (including the service of material) and identify any issues in dispute in compliance with the Criminal Procedure Rules and Criminal Practice Directions. The Sentencing Council issues this definitive guideline in accordance with section 120 of the Coroners and Justice Act 2009. Guidance on reductions in sentence for a guilty plea for under 18s is contained in the Sentencing Council Overarching Principles - Sentencing Children and Young People guideline to which sentencers should refer. The purpose of this guideline is to encourage those who are going to plead guilty to do so as early in the court process as possible. Nothing in the guideline should be used to put pressure on a defendant to plead guilty. is in the public interest in that it saves public time and money on investigations and trials. A guilty plea produces greater benefits the earlier the plea is indicated. In order to maximise the above benefits and to provide an incentive to those who are guilty to indicate a guilty plea as early as possible, this guideline makes a clear distinction between a reduction in the sentence available at the first stage of the proceedings and a reduction in the sentence available at a later stage of the proceedings. The purpose of reducing the sentence for a guilty plea is to yield the benefits described above. The guilty plea should be considered by the court to be independent of the offender’s personal mitigation. Factors such as admissions at interview, co-operation with the investigation and demonstrations of remorse should not be taken into account in determining the level of reduction. Rather, they should be considered separately and prior to any guilty plea reduction, as potential mitigating factors. The benefits apply regardless of the strength of the evidence against an offender. The strength of the evidence should not be taken into account when determining the level of reduction. The guideline applies only to the punitive elements of the sentence and has no impact on ancillary orders including orders of disqualification from driving. 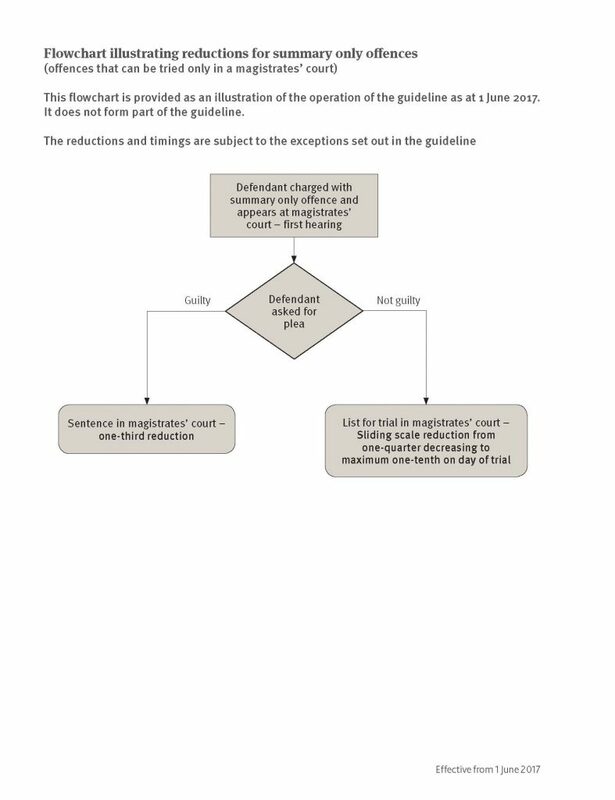 Stage 1 Determine the appropriate sentence for the offence(s) in accordance with any offence specific sentencing guideline. 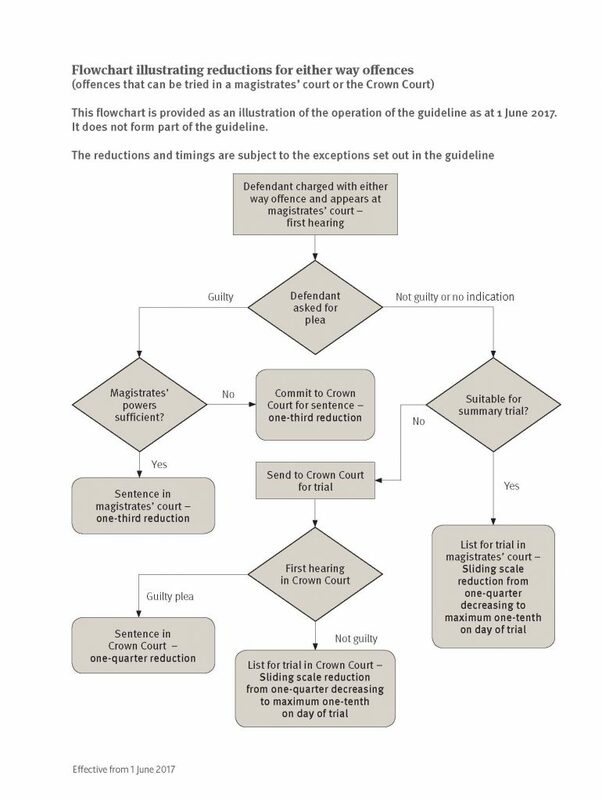 Stage 2 Determine the level of reduction for a guilty plea in accordance with this guideline. Stage 3 State the amount of that reduction. Stage 4 Apply the reduction to the appropriate sentence. Stage 5 Follow any further steps in the offence specific guideline to determine the final sentence. After the first stage of the proceedings the maximum level of reduction is one-quarter (subject to the exceptions in section F). The reduction should be decreased from one-quarter to a maximum of one-tenth on the first day of trial having regard to the time when the guilty plea is first indicated to the court relative to the progress of the case and the trial date (subject to the exceptions in section F). The reduction should normally be decreased further, even to zero, if the guilty plea is entered during the course of the trial. For the purposes of this guideline a trial will be deemed to have started when pre-recorded cross‑examination has begun. by reducing a community sentence to a fine. Where a court has imposed one sentence rather than another to reflect the guilty plea there should normally be no further reduction on account of the guilty plea. Where, however, the less severe type of sentence is justified by other factors, the appropriate reduction for the plea should be applied in the normal way. When dealing with more than one summary offence, the aggregate sentence is limited to a maximum of six months. Allowing for a reduction for each guilty plea, consecutive sentences might result in the imposition of the maximum six month sentence. Where this is the case, the court may make a modest additional reduction to the overall sentence to reflect the benefits derived from the guilty pleas. Reducing a custodial sentence to reflect a guilty plea may enable a magistrates’ court to retain jurisdiction of an either way offence rather than committing the case for sentence to the Crown Court. In such cases a magistrates’ court should apply the appropriate reduction to the sentence for the offence(s) arrived at in accordance with any offence specific sentencing guideline and if the resulting sentence is then within its jurisdiction it should go on to sentence. Where the sentencing court is satisfied that there were particular circumstances which significantly reduced the defendant’s ability to understand what was alleged or otherwise made it unreasonable to expect the defendant to indicate a guilty plea sooner than was done, a reduction of one-third should still be made. In considering whether this exception applies, sentencers should distinguish between cases in which it is necessary to receive advice and/or have sight of evidence in order to understand whether the defendant is in fact and law guilty of the offence(s) charged, and cases in which a defendant merely delays guilty plea(s) in order to assess the strength of the prosecution evidence and the prospects of conviction or acquittal. In circumstances where an offender’s version of events is rejected at a Newton hearing3 or special reasons hearing,4 the reduction which would have been available at the stage of proceedings the plea was indicated should normally be halved. Where witnesses are called during such a hearing, it may be appropriate further to decrease the reduction. If an offender is convicted of a lesser or different offence from that originally charged, and has earlier made an unequivocal indication of a guilty plea to this lesser or different offence to the prosecution and the court, the court should give the level of reduction that is appropriate to the stage in the proceedings at which this indication of plea (to the lesser or different offence) was made taking into account any other of these exceptions that apply. In the Crown Court where the offered plea is a permissible alternative on the indictment as charged, the offender will not be treated as having made an unequivocal indication unless the offender has entered that plea. There can be no reduction for a guilty plea if the effect of doing so would be to reduce the length of sentence below the required minimum term. Murder is the most serious criminal offence and the sentence prescribed is different from all other sentences. By law, the sentence for murder is imprisonment (detention) for life and an offender will remain subject to the sentence for the rest of his life. Given the special characteristic of the offence of murder and the unique statutory provision in Schedule 21 of the Criminal Justice Act 2003 of starting points for the minimum term to be served by an offender, careful consideration has to be given to the extent of any reduction for a guilty plea and to the need to ensure that the minimum term properly reflects the seriousness of the offence. 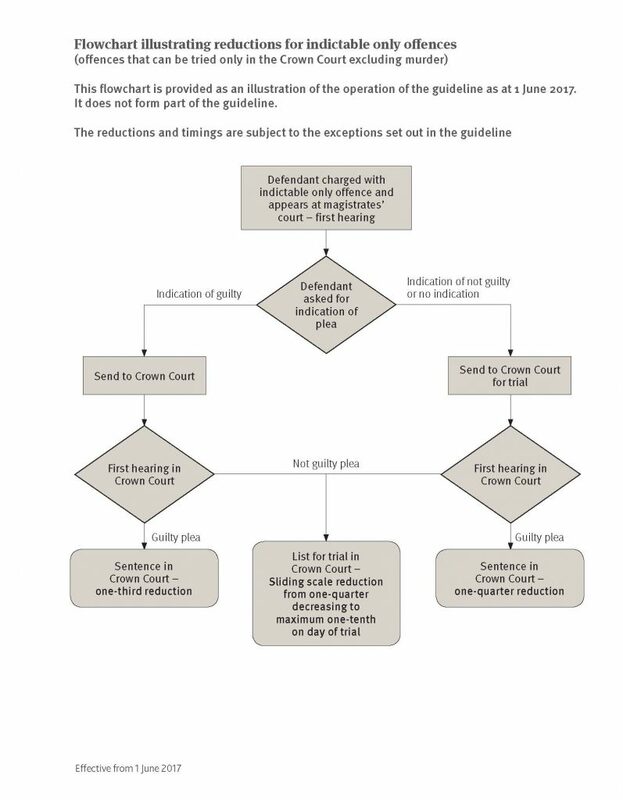 Whilst the general principles continue to apply (both that a guilty plea should be encouraged and that the extent of any reduction should reduce if the indication of plea is later than the first stage of the proceedings) the process of determining the level of reduction will be different. Whereas a court should consider the fact that an offender has pleaded guilty to murder when deciding whether it is appropriate to order a whole life term, where a court determines that there should be a whole life minimum term, there will be no reduction for a guilty plea. the maximum reduction of one-sixth or five years (whichever is less) should only be given when a guilty plea has been indicated at the first stage of the proceedings. Lesser reductions should be given for guilty pleas after that point, with a maximum of one-twentieth being given for a guilty plea on the day of trial. The exceptions outlined at F1 and F2 above, apply to murder cases. ‘Offence’ includes breach of an order where this constitutes a separate criminal offence but not breach of terms of a sentence or licence. In cases where (in accordance with the Criminal Procedure Rules) a defendant is given the opportunity to enter a guilty plea without attending a court hearing, doing so within the required time limits will constitute a plea at the first stage of proceedings. A Newton hearing is held when an offender pleads guilty but disputes the case as put forward by the prosecution and the dispute would make a difference to the sentence. The judge will normally hear evidence from witnesses to decide which version of the disputed facts to base the sentence on. A special reasons hearing occurs when an offender is convicted of an offence carrying mandatory licence endorsement or disqualification from driving and seeks to persuade the court that there are extenuating circumstances relating to the offence that the court should take into account by reducing or avoiding endorsement or disqualification. This may involve calling witnesses to give evidence. In accordance with s.144(2) and (3) of the Criminal Justice Act 2003.